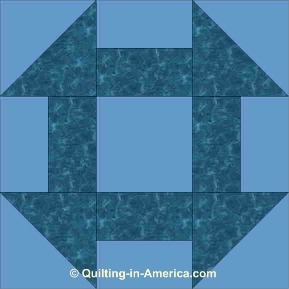 The Churn Dash is a very old 9-Patch quilt block pattern, originating between 1800 and 1849. Its name is a result of the resemblance of the triangle and rectangle perimeter of the block to a butter churn and the center square to the stick (or “dash”) of the butter churn. With only a few elements--triangles, rectangles, and squares-- the Churn Dash was frequently one of the first patterns learned by young girls. In spite of its simplicity, it also provides a challenge for advanced quilters because it lends itself well to very intricate designs. This particular variation of the pattern has gone by a multitude of names, including Broken Plate, Double Monkey Wrench, Double T (published in Hearth & Home), Dragon's Head (published in Woman's World), Fisherman's Reel, Hens and Chickens, Hole in the Barn Door, Indian Hammer, Joan's Doll Quilt, Lincoln's Platform, Love Knot, Ludlow's Favorite, Old Mill Design (published in the The Farmer's Wife), Picture Frame, Puss in the Corner, Quail's Nest, Sherman's March (published in Capper's Weekly), Shoo Fly, and Wrench. Much has been written about the Churn Dash or Monkey Wrench pattern being used in the mid-1800s as a clue to assist runaway slaves by the Underground Railroad. As romantic as that notion may be, there are many scholars who insist that for a variety of reasons it is not very likely. The exceedingly simple combination of triangles and squares of the Churn Dash pattern makes it easy to learn and construct, while also providing opportunities to create stunning quilts with intricate designs. Dozens of pictures and references to variations of this block and it's other names can be found in Maggie Malone's comprehensive collection 5,500 Quilt Block Designs.